Now, the timing of this discovery is interesting. I found this drone on the 11th of August. 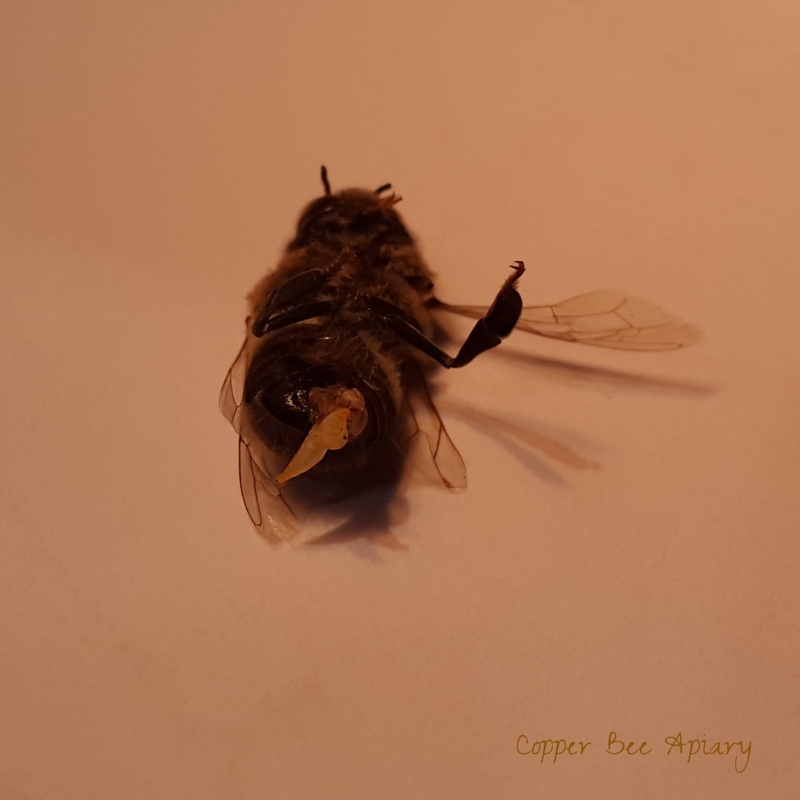 Queen Jasmine of the Cedar Hive died on the 22nd of July (reported here). The difference is 20 days. It takes 14-16 days for bees to raise an emergency queen from an egg that was previously destined to be a worker, then another 5 to 6 days before the queen is sexually mature. A new virgin queen could have been going on her mating flight from the Cedar Hive on the first sunny afternoon from the 10th August onwards. And what I was doing with my face so close to the patio on the 11th August was putting out the fairy lights with their solar panels to charge, because it was sunny. And the patio is directly under the flight path from the Cedar Hive. Has this drone fathered the next generation of bees in the Cedar Hive? No he hadn't, it later transpired. Since sadly the Cedar Hive did not raise a new queen. However, I also discovered that I am not alone in finding exploded drones around my hives. Rusty of Honey Bee Suite found four on a hive roof. The comments on her post offer the most likely explanation: the drones were evicted from the hive for indecent exposure!